Whether we turn our attention skyward to the moon or earthward to the trees and plants, Tu B'shevat's focus on the cycles of nature reminds us of our place in the cosmos! This week, the hellebores my husband planted last summer started sending up leaves and buds in our front yard... a welcome reminder that spring is just around the corner! 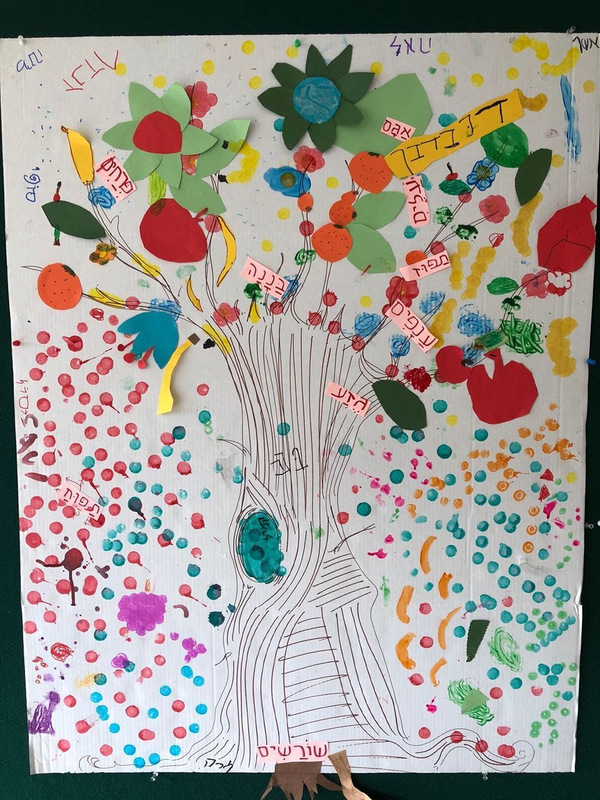 The kids in Kavana's after school program have been learning the Hebrew names of fruits and tree parts -- see the photo below of the beautiful diagram some of them created on Monday! And the rare and celebrated "super blood blue moon" from two nights ago also happened to be the full moon of Tu B'shevat! "Our lives today are inextricably woven to life in the past, both biologically and historically. We drink the water that our ancestors waded through when they crossed the Red Sea; we look at the same sky that Abraham gazed upon. Those who grasp these links learn awe, humility, and pride." On the one hand, we are but a tiny blip in history. This thought actually comforts me in this troubling political moment... that ultimately "this too shall pass." On the other hand, Tu B'Shevat reminds us that we are also a bridge to future generations. Like Honi in the famous Talmudic story about the man planting a carob tree (click here to watch BimBam's great video version of the Honi story), we must learn the lesson that future generations will reap what we sow, both literally and figuratively. May this holiday -- of both moon and trees, the mystical and the practical -- call us into a closer relationship with the earth, and inspire us to protect the environment for the benefit of generations to come.